also here is a close up of one of the pots which i like the most. But forgot its name. 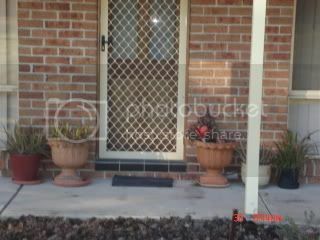 Re: pots out the front. Dont like post with out a respone. It's a member of the bromeliad family, too late in the night for me to think of it's right name but it's nickname is Princess Tears. It is putting on a lovely show for you. It's Billbergia nutans, and you have it, TheE - several, if fact. Should be in full flower for you now. 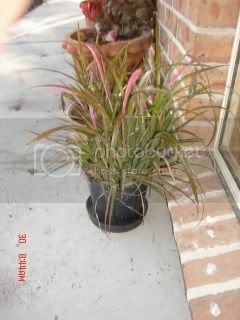 yes pam my Billbergia nutans is flowering now they look like pink coloured rain drops in away. they are toughies, and look so delicate when they are flowering.